A reader emailed me with a project request (thanks Kerry!)….. She was curious if I had seen the pillows at Pottery Barn that were knitted and if I had any experience re-purposing a sweater into one. Nope, I hadn’t. But I was sure excited to try it out. I found what she was possibly talking about here. And came up with my own pillow……made from an old sweater. And a tighter weave in the sweater would probably make it easier…but if you’re using a bigger weave or one that’s loosely knit, just make sure to sew slowly and carefully to catch all of the loose ends……..and to keep them from unraveling. Cut some squares, or even rectangles out of your sweater…whatever shape or size you’d like your pillow to be. Make sure to add a half inch or so on each side for a seam allowance. Then cut the same size out of some cotton lining. So 2 pieces of your sweater and 2 pieces of your cotton lining. First pin your sweater piece to your lining piece all the way around the edge. Trim any uneven edges. Then sew the two pieces together with a 3/8 seam allowance. Use a big stitch, as to not pucker the sweater. Try using a big zig-zag if you’re having trouble keeping the sweater flat and even with the lining. Do the same with the other sweater and lining piece. Then sew your two pieces together with right sides together. Leave a 4-5 inch opening along one side. Now trim the corners off, zig-zag around all of the edges, turn right side out, and poke your corners out with a pencil or something pointy. Now stuff with batting…. And then hand-stitch the opening closed. Tutorial found here. And wow….you’re own sweater pillow. **To find the tutorial for the pillow cases behind the sweater pillow, click here. Very, very pretty Ashley! And I love the print on your bedding! Thanks for sharing! Beautiful. Thanks for the tutorial. I love your bedding, too. So fresh, and not really "seasonal" (which I like). You have great style. Thanks for sharing. Thanks for the tutorial,I like this. I think it would be fun for my couch. YES!!! I just went through my clothes and hung onto one of my sweaters even though I KNOW it doesn't fit me right (I have too long of a torso – I'm sure you needed this information). This is totally what I needed it for! PLUS, it has a really cute pocket on it that I think I'll keep for the pillow. I have a sweater I can't quite salvage for wearing, this would be a perfect project for it! Thanks! I love this!! I also have to tell you how much a LOVE your blog! I stumbled across it one day and it's now my favorite. You have great ideas and I admire your willingness to try everything. Thanks for sharing! Ohh I love it! THanks for the great tutorial. I have a few sweaters just waiting for a new look and I think this is it! Love it! Beats paying $40 for a pillow cover (not a pillow, just a cover) any day. I forsee a few of these ending up on my daughter's bed. You make it look SO easy. I just love your blog. So cute! I love those! Hey have you ever made Roman Shades before? I want to make some but was unsure how to really start with the pulling system etc. Do you have any ideas or have you done these? I really don't want to hire someone to make them for me. Love it! I will now look at sweaters in a whole new way! Love this! What a great idea! :) Thanks! great idea. Thank you so much for showing how you did it. :) looks wonderful on your bed. I am doing this when I get home tonight! I cleaned my closet out recently and came across an ivory cable knit sweater I wore to my bridal bruncheon. I can't wear it anymore (when was I a SMALL?! ?, well apparently 4 years ago) but I can't bring myself to give it away. The perfect solution is to make a pillow out of it and put it on our bed. Thanks for the inspiration! Ashly, not sure If Ive mentioned it before.Look up Steeking. Knitters use this when youve knit a project and decide to say, add a zipper or something. Its very easy. Use the sewing machine with the sts set close together to sew the sweater before you cut it to hold the sts together.Say 1/4 in. away from the seam. Hope this helps! very cute! My to do list is growing rapidly. I really need finish getting my craft room organized so I have a place to work! We are in the process. Keep checking my blog to see what changes we're making. Or rather what changes I've wrangled my husband into helping me with. :) I am way excited! those are awesome!! i'll have to try this – we are re-doing our boys bedroom and pillows like that would be perfect! Hey! Love all your ideas. There was a comment asking about roman shades. I found this great tutorial and as soon as I buy(I'm renting) I plan on making them. Hope it helps…littlegreennotebook.blogspot.com. Cute pillow! I love your blog…any ideas on how to downsize one of my husbands ties for my son? This is such a great idea! I saw it on a show on HGTV and thought it was so creative – and simple, which I love! I'll have to keep my eye out for pretty sweaters at the thrift shops and garage sales this year! The Domestic Contessa's latest blog: 15-Minute Tackle: Weekly Link-up + Giveaway! I LOVE your blog! You make some fabulous things that I am excited to try. You're probably sick of pillows, but if you get the urge to do one more here is a link for one by martha stewart that I love. http://www.marthastewart.com/how-to/textured-pillows?backto=true I am a very inexperienced sewer and the directions are pretty lousy on this website. If you ever make it I would love to see some better instructions on your website so I could try it myself. Thanks for our inspiration! I love your blog…coming here my PROJECTS TO DO list just keep getting LONGER!!! I feel like i need to dig through my closet and make one of these!!! Hey AShley–I love this sweater idea! SO CLEVER! I will definitely have to give this project a try, too! Also, I was wondering if you would let me know where you got the fabric for those other pillows on your bed?? SO cute! Lauren, that fabric is the Amy Butler Lotus(?) collection. I found it at fabric.com. But if they're out….try googling it. Hello Ashley! 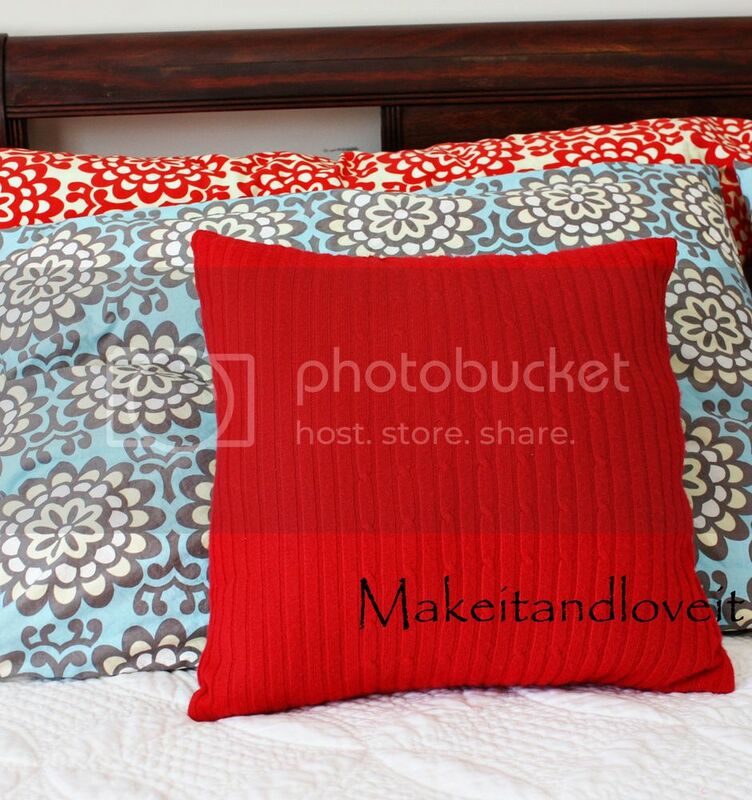 We are posting about fabric pillows and are going to mention your blog – just found it – very cute, fun ideas! I would love to know more about your cutting table! Did you make it yourself? It is such a nice size and I love the little shelves underneath. When I think of the sweaters I've donated to Goodwill! Ah well, all for a good cause. But in the future, I'mm going to make pillows out of old sweaters. What a great idea! Great project – I linked it to my "pillows" post at my blog too! My mom knitted sweaters for my sister and me. I found 2 of those sweaters in my sister’s throw-away pile and took them. They have been in my closet for years without being worn. I ‘d like to cover a pillow or two for my sister’s birthday with these sweaters. Any suggestions? Simply great! You get very good thoughts! Perfect! I love your blog. Thanks for sharing all these things!